In February the Economic Sentiment Indicator (ESI) continued its recovery that has started in October/November of last year. 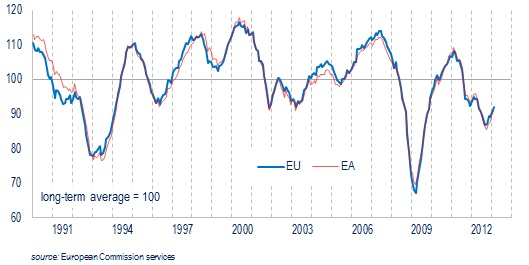 The marked improvement by 1.6 points in the euro area (to 91.1) and 1.2 points in the EU (to 92.0) was driven by increases in industry and services. Consumer confidence also improved marginally. Retail trade and construction, on the other hand, booked moderate decreases. The ESI has however contracted substantially compared to last year.